I was going to write about my amazing trip to The Ginger Pig farm up near Pickering this week but I've been so insanely busy it'll have to keep for a day or two more. So let me highlight instead the ridiculous amount you pay to have your cheese chopped up into squares. 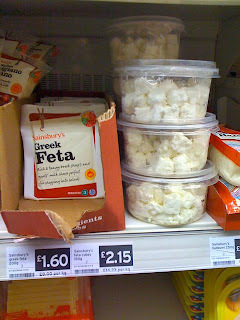 Spotted at Sainsbury's in York: a 200g pack of feta for £1.60 for 200g next to a - wait for it - 150g tub of feta cubes for £2.15. That's £14.33 a kilo compared to £8 a kilo. I don't know what to get more worked up about - Sainsbury's for ripping off its customers or our apparent inability to cut a piece of cheese into squares which would take all of - oooo - 45 seconds? A minute, max. Who doesn't have time to do that? Or who considers the time saved worth £1.27*? Plain daft, if you ask me. Anyway, good opportunity for a rant. Have you spotted any pre-prepared products that get up your nose? Or, come to that, ones you think are worth buying? * The difference in price between 200g of the uncut cheese and 200g of the pre-cut cheese. I think. Maths was never my strong suit. That's ridiculous! It's not even 200g v 200g, it's 200g for the unchopped, 150g of the chopped! Noticed in Sainsbury's yesterday, 2 chicken breasts for £2.50 on the butcher's counter, and what looked like exactly the same size/quality ones pre-packaged for £4. The packed ones were part of the 3 for £10 meat-deal S's are running at the moment, so still more expensive even after the offer! I'm constantly amazed at price discrepancies in supermarkets. I could go on all day about them! I only buy prepared cheese or food if it's reduced cheap enough. Then obviously the premium is then cancelled out. What once made me laugh was eggs sold in cartons either as whole eggs or white in the US supermarket chain Wholefoods. How difficult is to crack and maybe separate the eggs as you please? If I stretch my imagination really hard, maybe you are having an impromptu picnic and you don't have a knife? 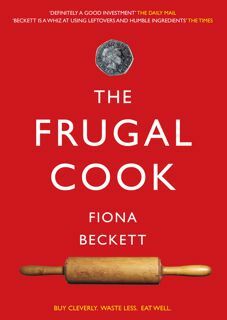 Might be useful if you were attempting one of Jamie O's so-called 30 Minute Meals? I'm not sure if it's law Darien but it's normal for supermarkets to put the unit price on the shelf. Thanks anonymous - do post details of your blog! I was recently in a large tesco store and picked up a 500gram packed of dried apricots for £1.99, then looked further down the shelf and they were selling 1kg of the same dried apricots for £5! I couldn't believe it, there was absolutely no difference in the apricots. This was ridiculous, how can they get away with doing this, they even put the price per 100g beside the total price.